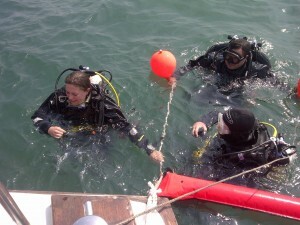 Compressed air used by divers should conform to BS EN12021. This standard gives the basic parameters for the composition of the air and the limitfor for contaminants that are often found in breathing air. These limits are based on a value that is 10% of the 8-hour time weighted average in the workplace in the UK. 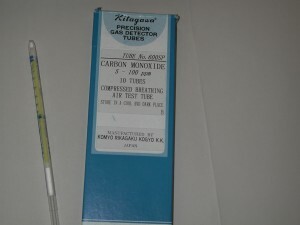 (Carbon Monoxide is 8%). Oxygen (O2) should make 21% (±1%)by volume in dry air. The air must be without significant odour or taste. 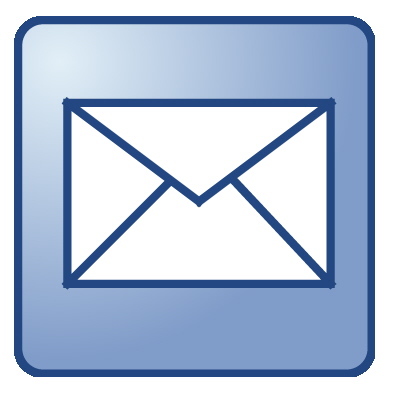 BSEN12021 specifies that the air purity should be at least tested every 3 months. For clubs operating their own compressor who need not strictly comply with this standard should have the air tested every year as an absolute minimum and again after any work or maintenance that may affect the air purity. In addition to these parameters the compressor manufacturer may also specify that tests for specific chemicals be carried out. 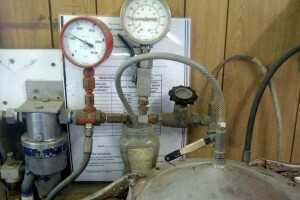 The compressor operator should also test for contaminents in the vicinity that may find their way into the system. 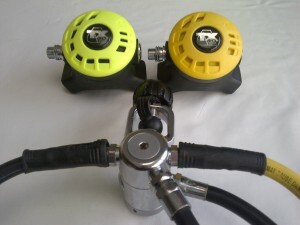 A good example may be a test for chlorine if the compressor is located near a swimming pool. 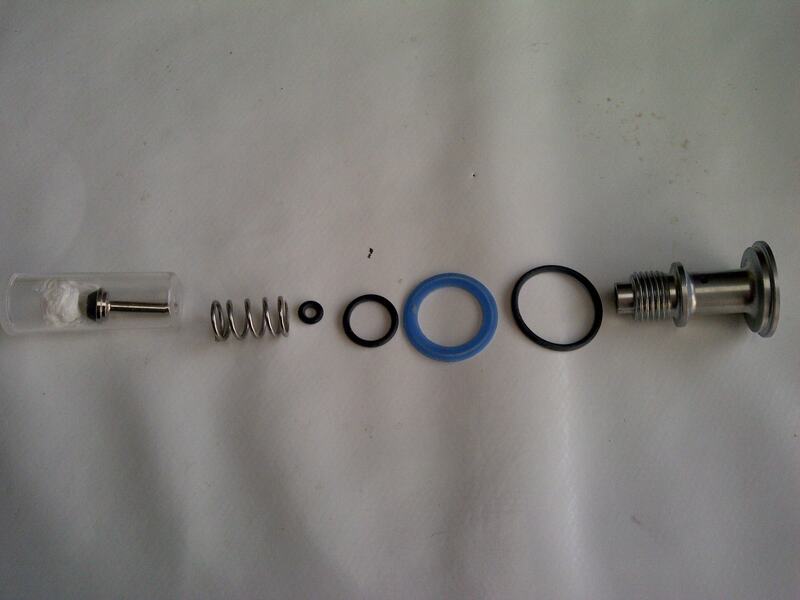 Firstly you will need to fill a cylinder from the compressor. 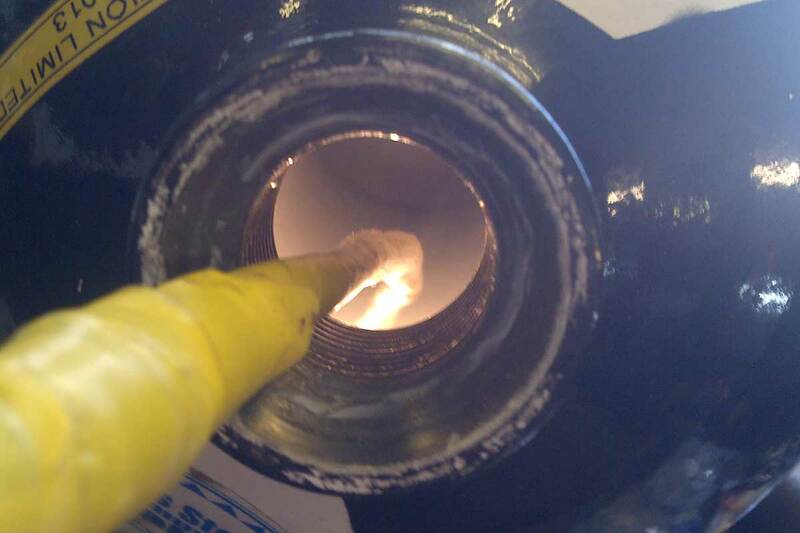 The cylinder should be clean, a freshly oxygen cleaned cylinder is ideal, this will minimise any contaminants that may have built up inside a frequently used cylinder. 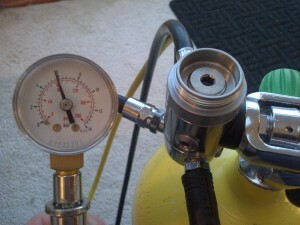 The compressor should be run up to it’s normal working temperature and in normal conditions. The cylinder should be empty to start with and filled to at least 100Bar. 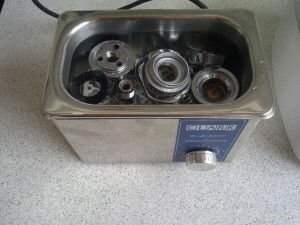 The air cylinder should then be emptied again and then filled for testing. 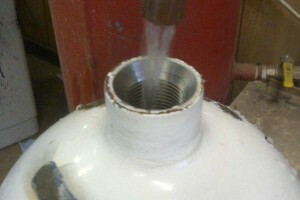 Doing this will reduce the contaminants that may have been in the existing air in the cylinder down to a minimal level. There are many ways to test for air purity. 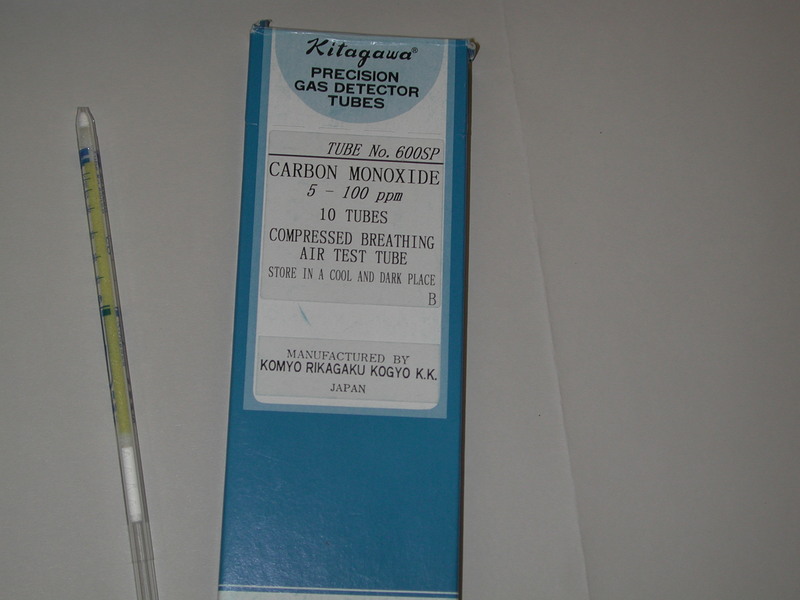 The following is a simple method using gas detection tubes. 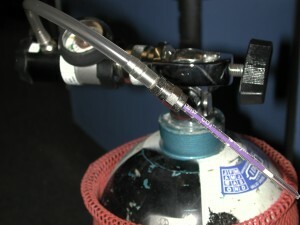 Most detection tubes require a fixed volume of air to pass through them. 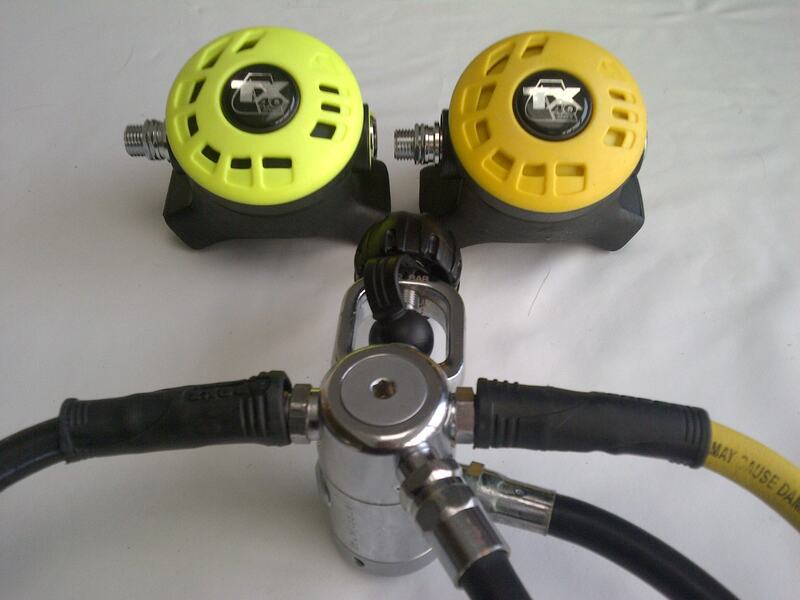 This can be done using a fixed volume syringe type pump that will be available from the manufacturer. The following example uses a constant flow valve. 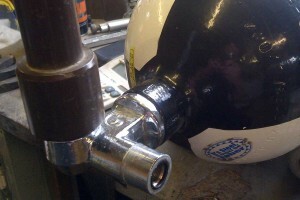 Firstly a regulator is fitted to the cylinder that will provide a fixed flow of gas from the cylinder under test. 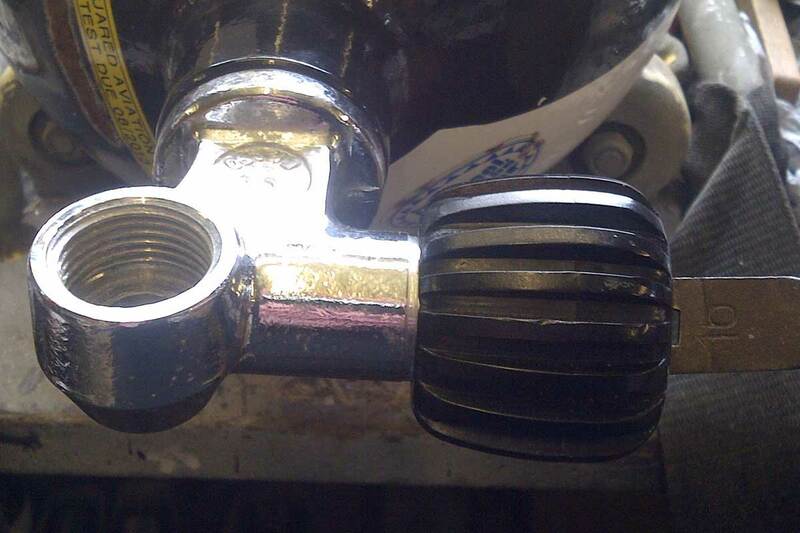 With the test tube in place the regulator is turned on to provide a fixed flow rate that is specified for the tube. 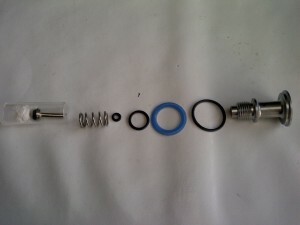 The tube will also have a time that the test flow should be allowed to run through the tube. It is very important to allow free flow of gas through the tube and not to restrict the outlet. 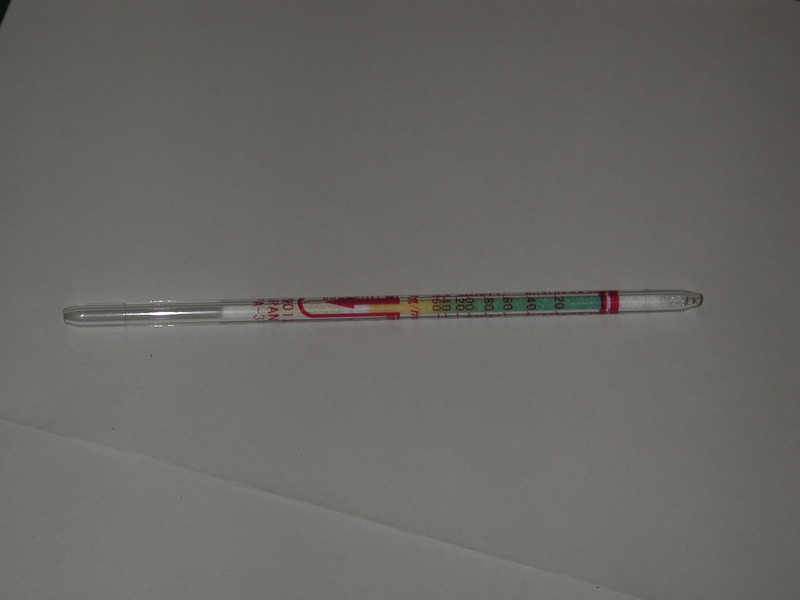 During the test the reagent in the tube will change colour in proportion tot he amount of contaminent in the sample. At the end of the test the measurement can be read of the scale where the reagent has changed colour. 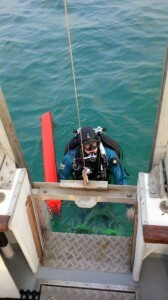 Each tube is designed to detect a specific contaminant in a specific range. So the test is repeated with all the relevant tubes necessary. 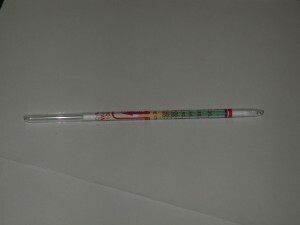 The instructions with the tube will give the color change as well as the time and flow (or volume) of gas that should be used during the test. |Other parameters such as corrections for temperature and which other contaminants may give rise to a false reading are detailed. Lastly instructions for safe disposal information and first aid for the chemicals in the tubes are included. 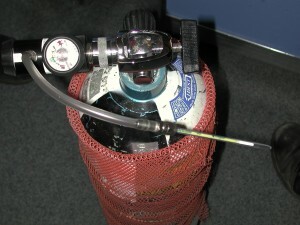 The cylinder is filled with water. 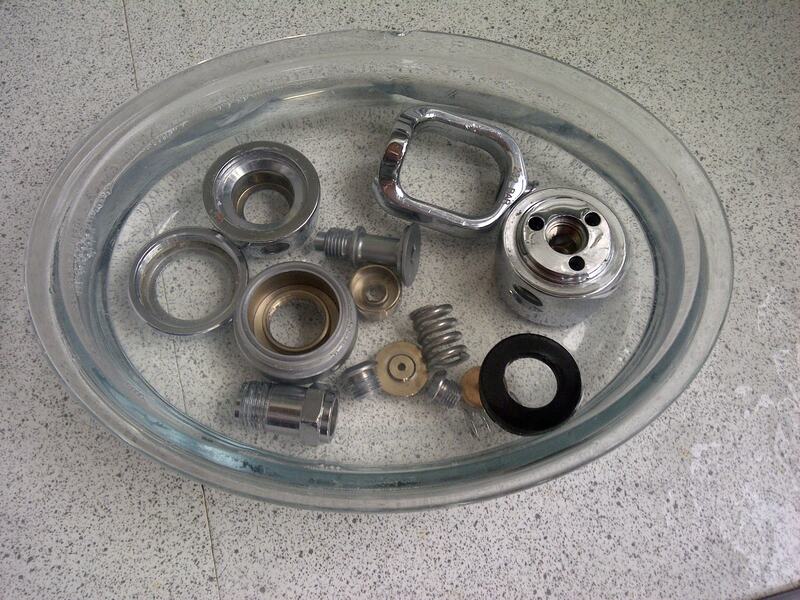 Liquid is used as it does not compress greatly under pressure. So if a cylinder does fail there is not a great mass of expanding gas to cause damage. 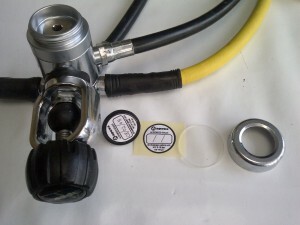 The cylinder is dropped into the water jacket and the hose is connected to the hydraulic pump. This is done by a fitting in the side of the water jacket. 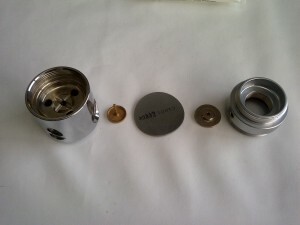 The lid of the water jacket is then then fitted which has a water tight seal. The jacket is then purged of air with water. 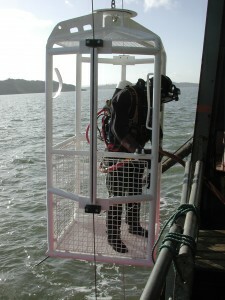 The level of the water is set on a graduated tube attached to the jacket. 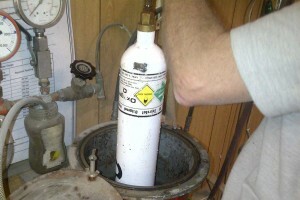 The cylinder is then pumped to the test pressure. 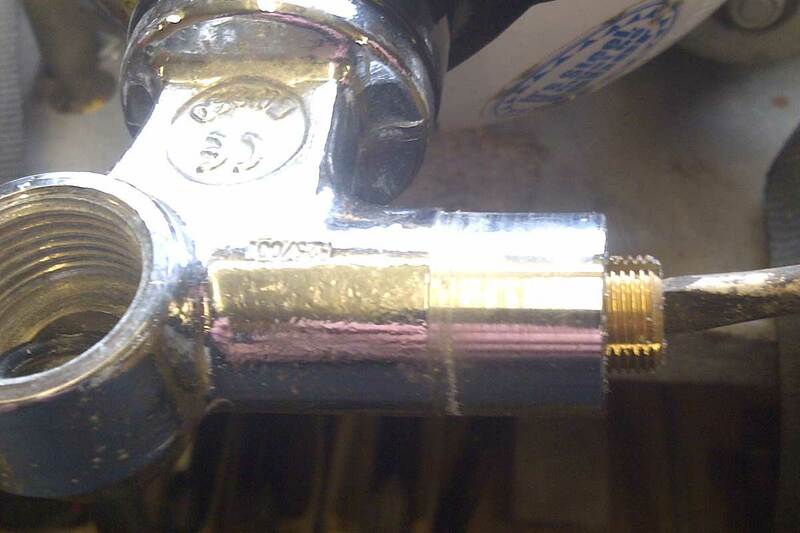 This is usually 1.5x the working pressure so 348Bar for a standard 232Bar cylinder. 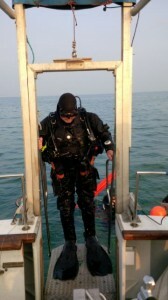 The pressure is then held for 30 seconds. As the pressure increases the cylinder will stretch. 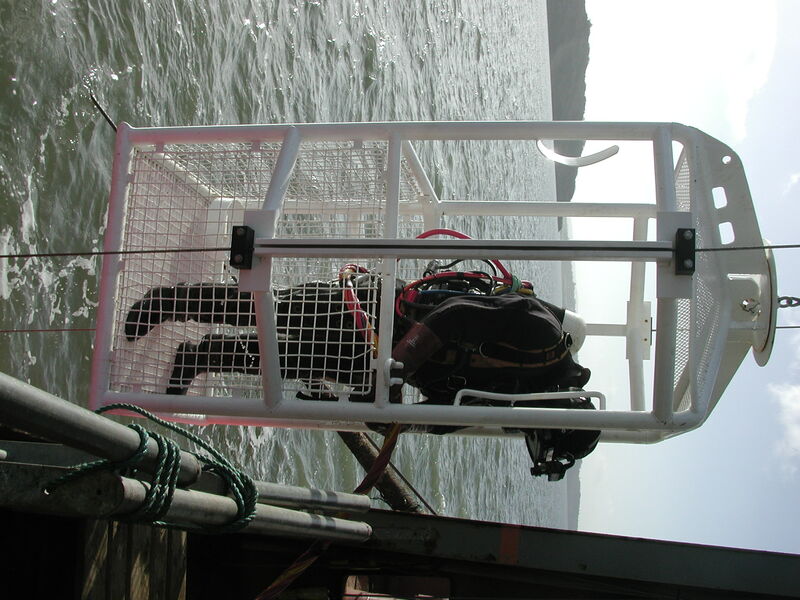 As it does so the water in the jacket is displaced and the amount of displacement is measured on the graduated tube. When the pressure releases the cylinder relaxes and the water level drops below the initial level. The amount of water displaced during the pressure cycle and after is used to calculate the permanent set of the cylinder. The cylinder is then removed from the jacket and emptied of water. 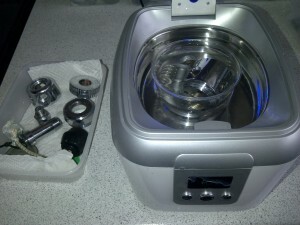 Water inside a cylinder is not good so it must be dried. 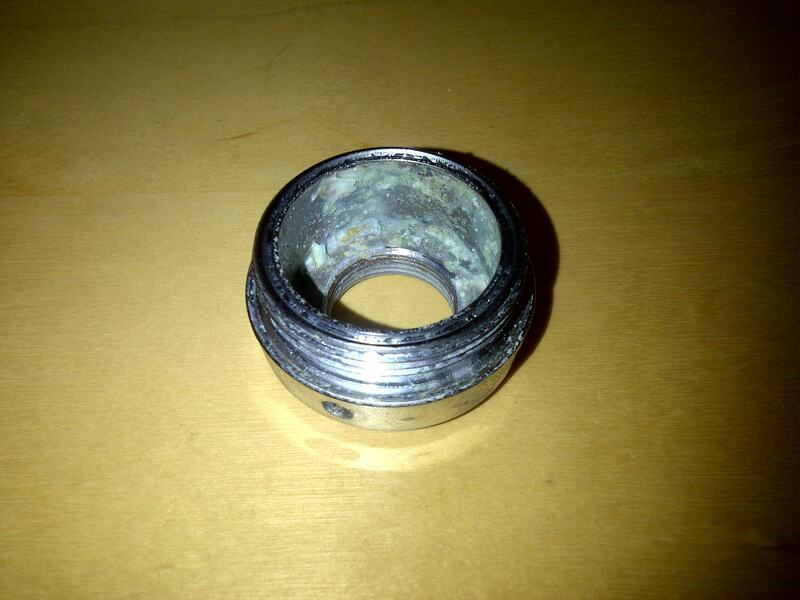 If left in the cylinder will rust, even a short exposure to the atmophere can cause flash rusting. Once empty the cylinder is inverted over a steam jet. 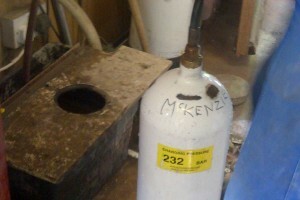 This heats the cylinder and with the addition of chemicals the cylinder can be hot oxygen cleaned. 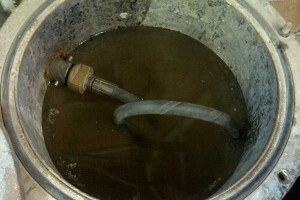 When hot the cylinder is dryed with an air jet and again inspected internally to ensure all the water is removed. The main danger of cold oxygen cleaning of cylinders is the fact that it is almost impossible to dry the cylinder adequately or fast enough. This is done with a set of punches. The year and month of the test is put on the cylinder along with the test stations unique identification stamp. 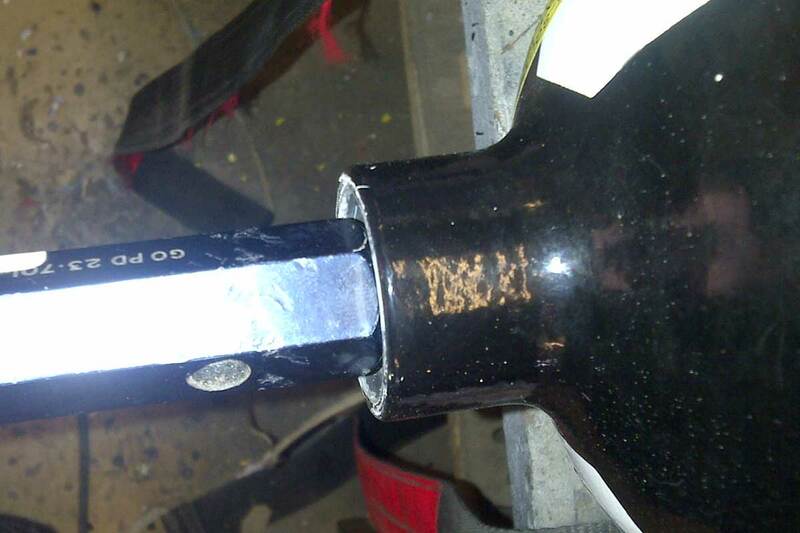 A “V” is stamped at the end if the cylinder has just had a mid-term inspection and not a full hyro test. The valve is re-inserted into the cylinder with a new O’ring. A tool is inserted into the valve outlet and a torque wrench is fitted so the valve is fitted to the correct setting. If this is done the cylinder does not leak. 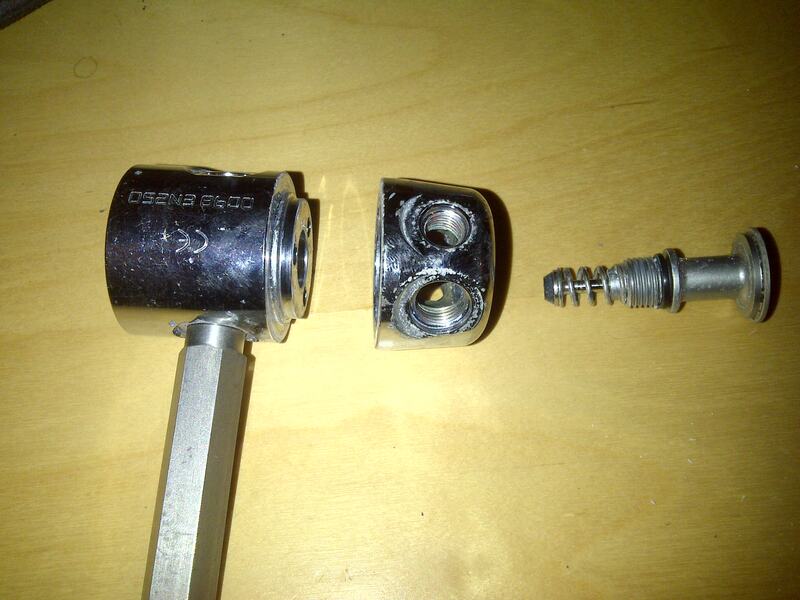 It is not acceptable to fit the cylinder valve with a spanner and a hammer. A visual test or inspection of a diving cylinder is made before a hydrostatic test is made. It is also done half way between the hydrostatic test cycle to verify the condition of the cylinder. The first step is to inspect the threads for damage and to gauge them to see if they are in tolerance. 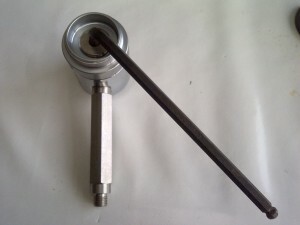 This is done with a pair of calibrated gauges called the “GO” and “NO-GO” gauge. Simply the GO should wind on or into the thread and the NO-GO should not. 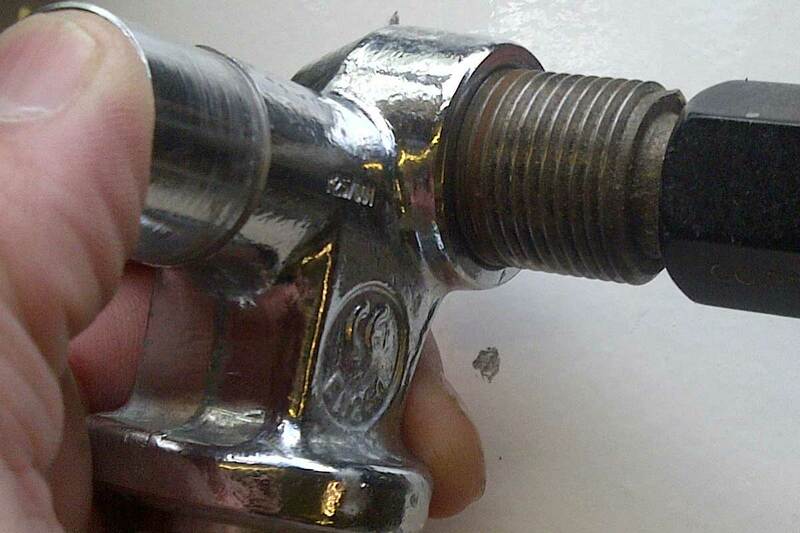 Threads are one of the major causes of cylinders to fail and usually it is due to maintenance by non-trained persons. This is done externally and internally. 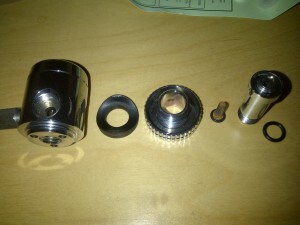 Externally the boot is removed and the general condition of the cylinder is checked. Defective paint will not fail a cylinder. Deep rust marks and damage are the problem. Internal visual inspection is done by using a bright light and endoscope. This can even look back a the shoulder of the valve internally. Deep rust marks are the issue. Cylinders may have a light rusting over the inside. This is not a fail. 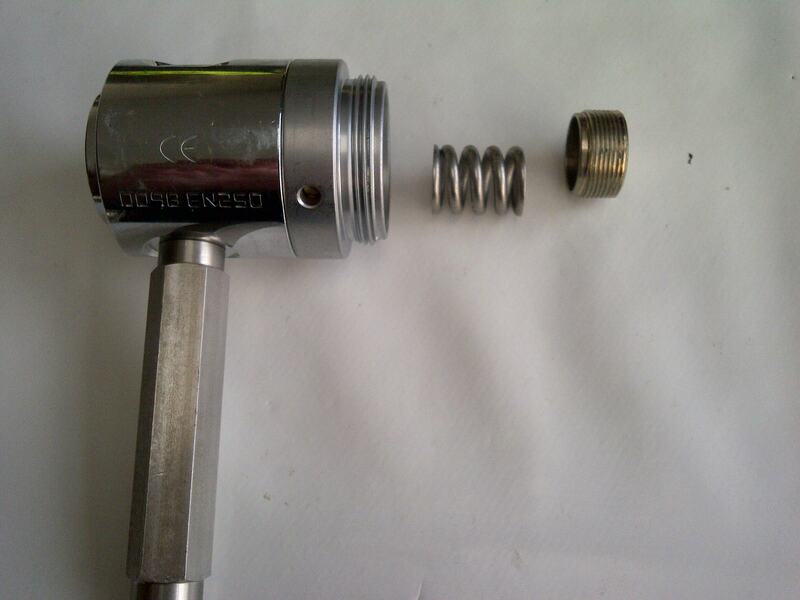 The first part of a cylinder test whether it is hydrostatic or visual is to remove and disassemble the valve. 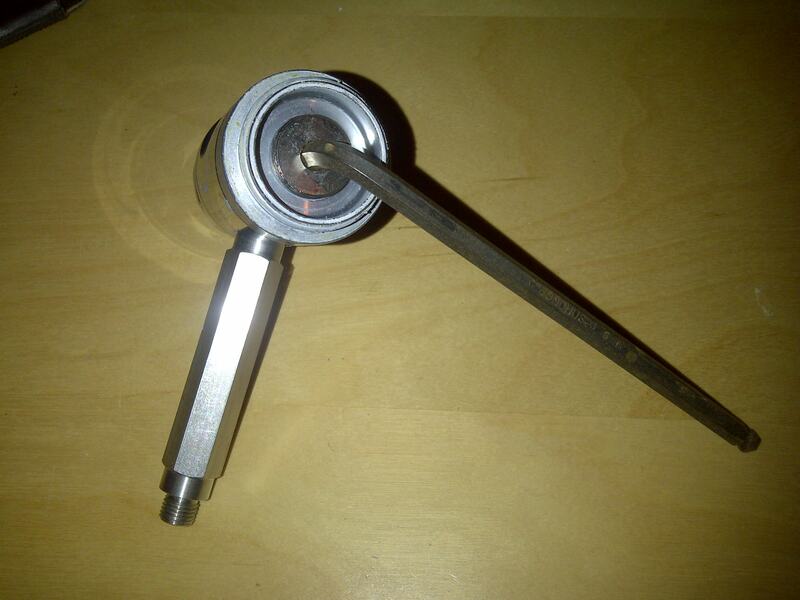 This is done with a special flat bladed tool that straddles the centre thread. This one is in fact made from a flat bit. This is done so that it can be attached to an impact driver, as they can become difficult to remove after a couple of years use. The nut once removed allows the spring, then the handle and finally the nylon washer to be removed. 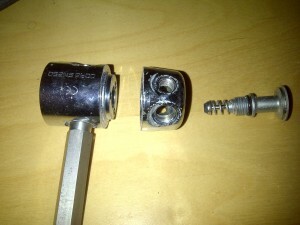 Next the screw mechanism is removed. This is done by unscrewing the nut at the end of the valve. Once removed the spindle should be removed from the cylinder valve. 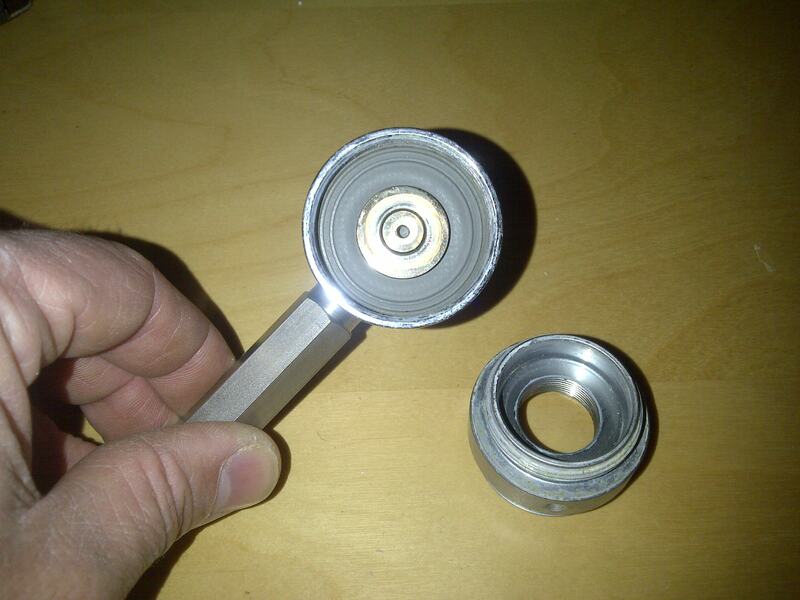 There is a nylon washer on the shaft and o’ring seals at either end of the body. The final step is to remove the valve seat itself. There are various types. Some are all nylon whilst others like the one pictured are brass with a nylon face. 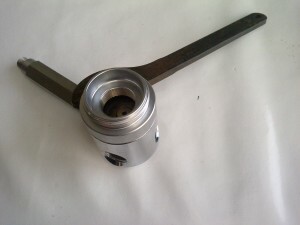 This one has a slot in the back that the blade on the spindle fits into. Others are the reverse with the spindle having a saddle that fits over a flat on the back of the seat. All are basically the same. 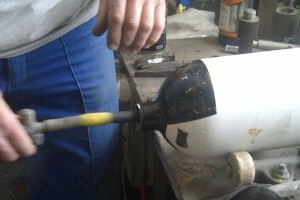 Lastly a tool is inserted into the valve and very delicately loosened with the aid of a large hammer. 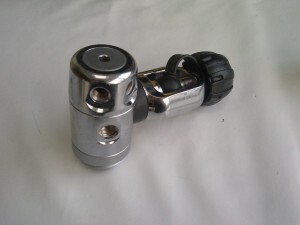 A-Clamp valves have an adapter that fits over the body to allow the DIN tool to be used. 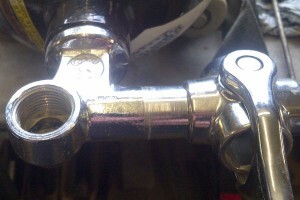 Spanners are not recommended as they will damage the chrome and brass of the valve. Now that all the parts are cleaned we can start the process of assembly. 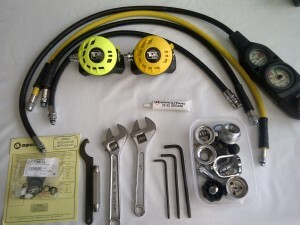 First we get all the parts and tools together. Take the main body and drop the mushroom into the body. 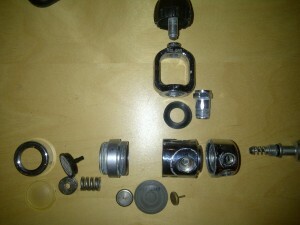 The diaphragm can then be pushed into place and the metal disk that the spring sits on goes next. 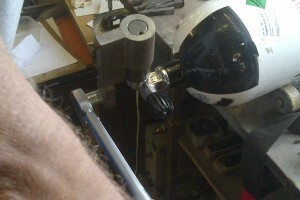 The top part of the body can now be fixed ensuring that the body does not clamp onto the disk. Set the body upright and make sure it is free to move in its housing. 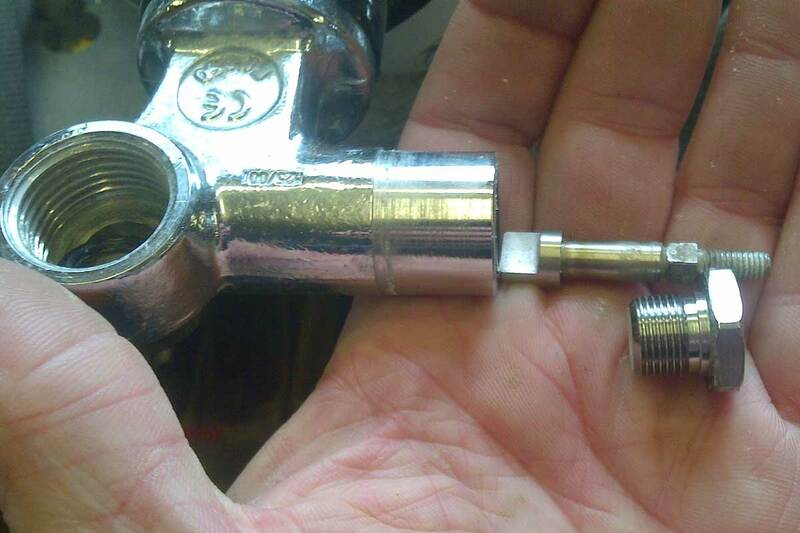 Then tighten down with the pin spanner. This is the only tricky bit. Grease and press the small O’ring into the top of the body. 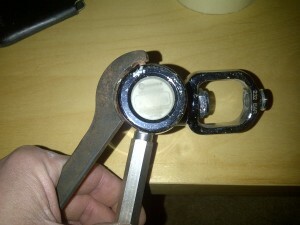 Also fit the medium sized O’ring around the middle. The spring goes on and then push the valve seat into the centre of the small O’ring. That’s it. The larger O’ring and bearing washer is in fact easier to fit at the next step. Grease the large turret washer and fit to the body. Place the turret on top. 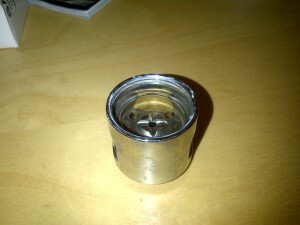 Then fit in the blue bearing washer and larger Valve O’ring into the top. With the valve upright the valve assembly can be dropped down into the body so that the hole in the seat itself sits on the mushroom from the other side. 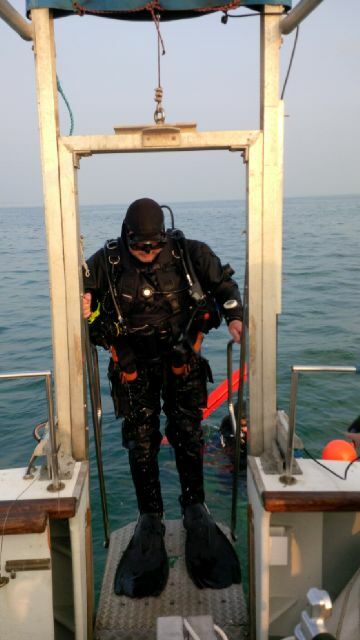 A small amount of pressure is needed to push down to be able to tighten everything up. The turret O’rings are the main moving parts and may need a bit more grease. All other O’rings should have just sufficient for assembly. It is very important to assemble the diaphragm end before the turret as the spring keeps the seat of the knife edge in the body. If that is damaged it is likely to be the end of the valve. 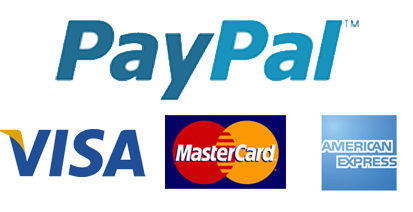 There is a slight difference between the two systems. For the A clamp the white filter is pressed into the shaft from the “cylinder” end. The DIN fitting has a cone shaped filter inserted from the “valve” end. With the filter in place the shaft goes through the A-clamp or DIN fitting through the plastic spacer and screwsinto the main body with the O’ring in to seal. 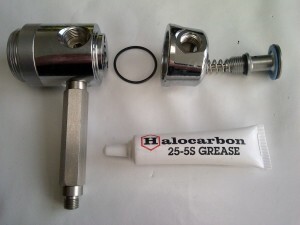 It is best to put it all together and hold everything upright to screw into the body as the O’ring can easily pop out and be damaged when tightened. 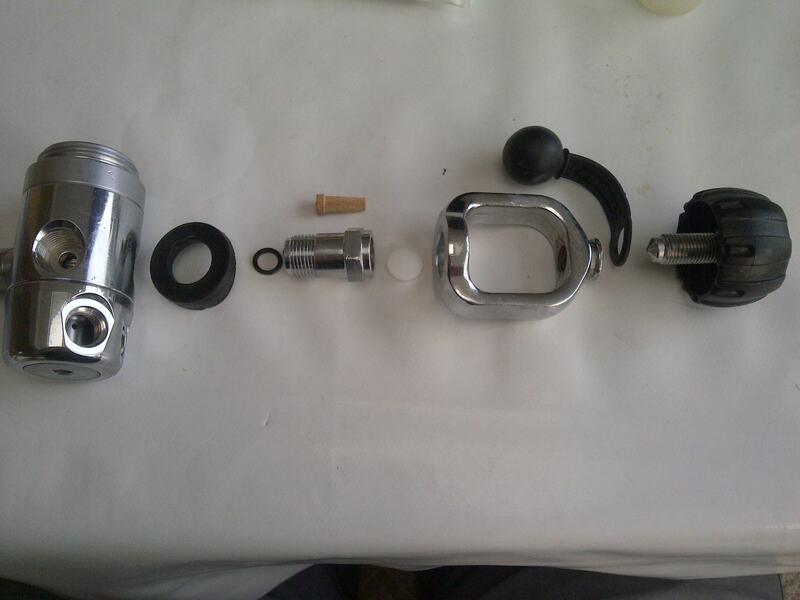 Step 5 – Attach the peripheral parts. With everything back together the valve is connected to an air supply. This should be around 70 Bar and not a full cylinder. For the first time at least it is a good idea to press the purge on the second stage when applying the pressure to bring the pressure up slowly. 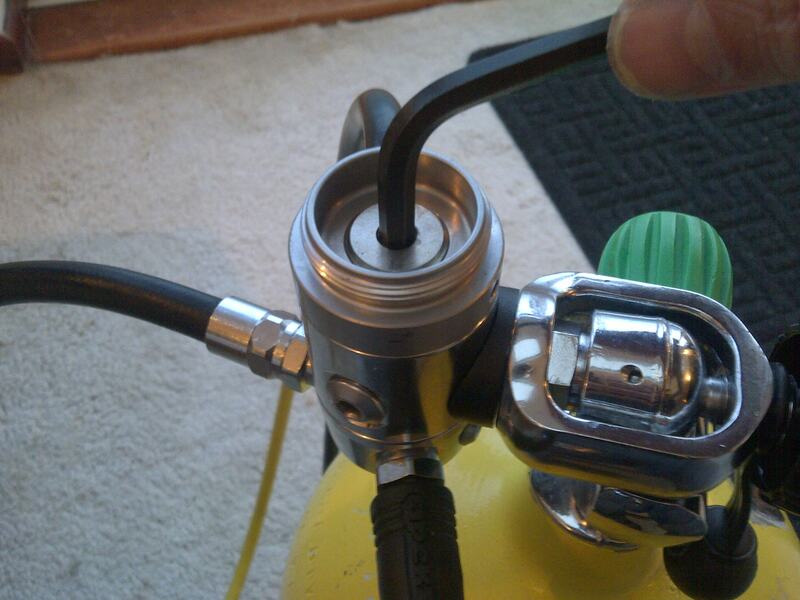 Purge the valve several times to allow for a bit of settling. 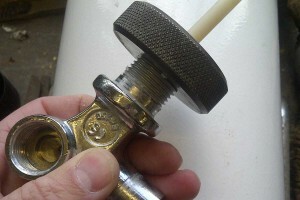 Attach a pressure gauge to one of the intermediate ports. Adjust the pressure using the allen key to the required pressure. This is typically between 9 and 10 Bar, but may vary due to the application. It is better to purge the air first before each adjustment. Lastly the dry seal system can be attached with the new service date sticker fitted to below the clear plastic membrane. The second stages may also need adjustment to match the new interstage pressure. A starting point is the need to service some regulators. 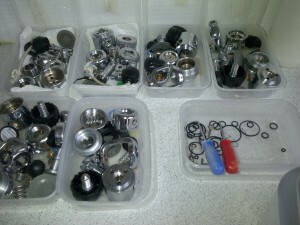 The ones shown are all Apeks regulators. (Actually there is also a domiflow oxygen valve on the right). These regulators are typical of diaphragm first stages. 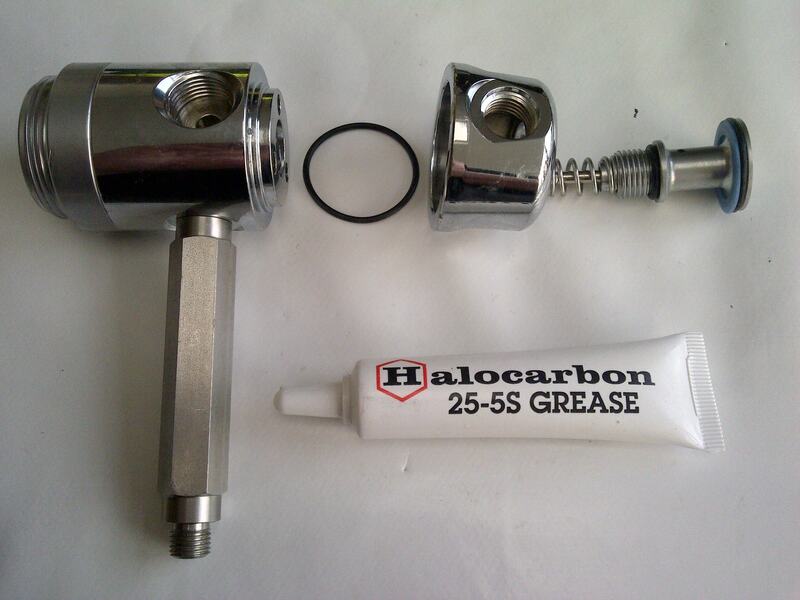 Other manufacturers will look very different but on the whole the principle of operation is the same and the servicing procedure is very similar. 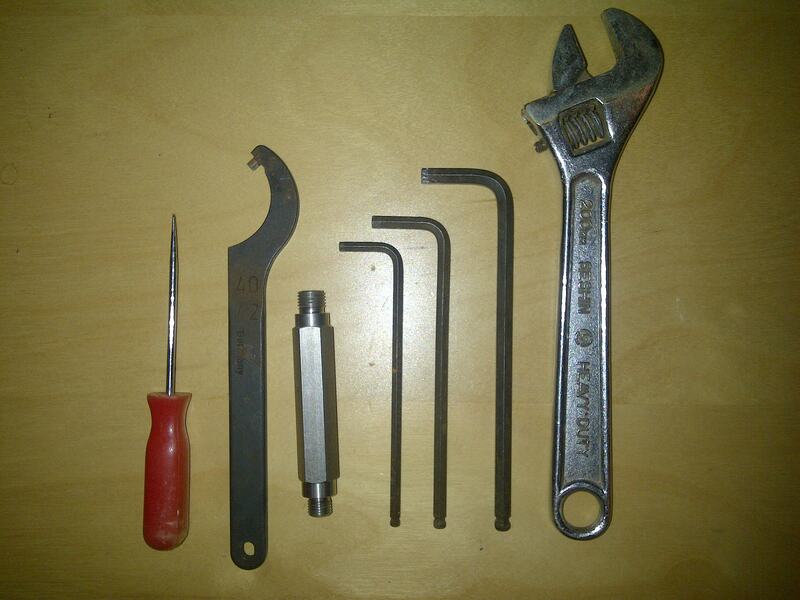 A few tools are needed. Most are standard, but a pin spanner and a bar to insert into the regulator ports are fairly essential. 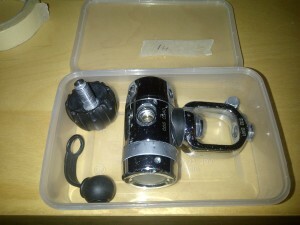 By this I mean the contents gauge, inflation hoses and the second stages as well. 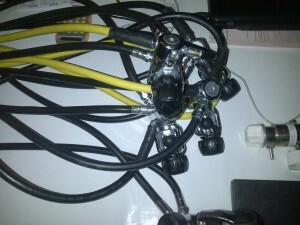 Also remove the blanking plugs and any dust covers. 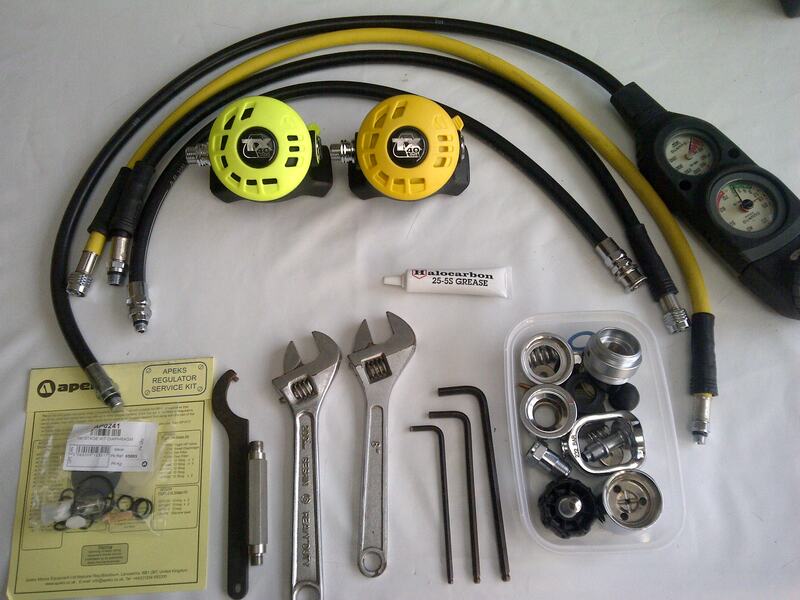 Note: that a numbered box is really useful to keep parts together and to identify the regulator if you are servicing more than one. Use the special tool to lock the valve body. 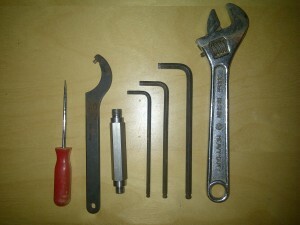 Once in place a large spanner can remove an A-clamp adapter or use an Allen key to remove the DIN adapters. 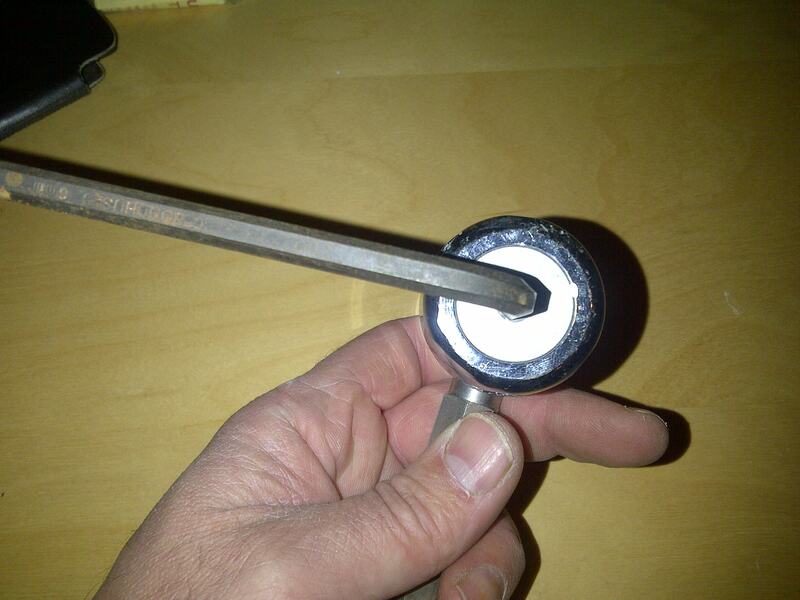 The dry seal system can be removed using a pin spanner. This stage is not required with the non-sealed first stages. With the dry seal system removed the intermediate pressure adjuster can be removed with the spring below. 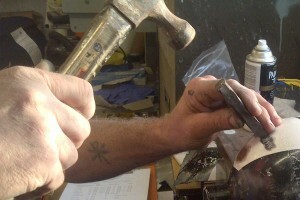 Once this is done the top body part can be removed with a pin spanner. This reveals the diaphragm with its protective metal plate. This can be removed with the metal mushroom below. Now the turret can be removed with the valve seat assembly.